This was a fun and easy Christmas ornament. I don't remember where I first learned this - sorry but I made a few this year, including a couple for a fund raiser and they were a big hit! In fact, to my surprise, they raised the most money. They are so easy, I was really almost embarrassed. First you need 20 2" diameter circles. I have a paper punch, but you are welcome to cut them out. This can be done monotone, or use matching paper, as I did in this picture. I also use a glue stick, beading wire, and some beads. Second, score or draw a triangle into the back of the circle. It should look something like the second attachment. I do this to all 20. Third, the first thing to make is the top and bottom of the ornament. 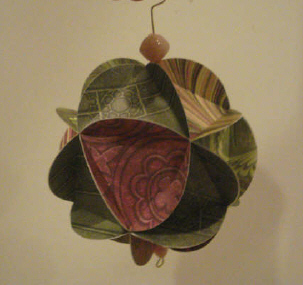 Using 5 circles, now folded into triangles, glue five together so they all touch at the top and make a kind of hat. Do this twice. Fourth, I make the middle by laying out the next 10 and glue the sides to make a straight line. One triangle will be upside down and one rightside up. Then, glue it together to make a circle, or tube. Fifth, glue the top to the top and the bottom to the bottom. When it is all dry (and you can spray it with glitter spray and it looks so pretty!) then thread the wire up through the middle. Put a bead on the bottom and make a tight circle and another bead on top. I circled the wire to make a hangy thing. Viole! You can also thread it with matching ribbon and it looks very pretty. You can use beads, charms, or just knot the ribbon at the bottom. Copyright © 2007 by Tifani Sant. All rights reserved.